How about a little Charles Bronson for your Thursday? 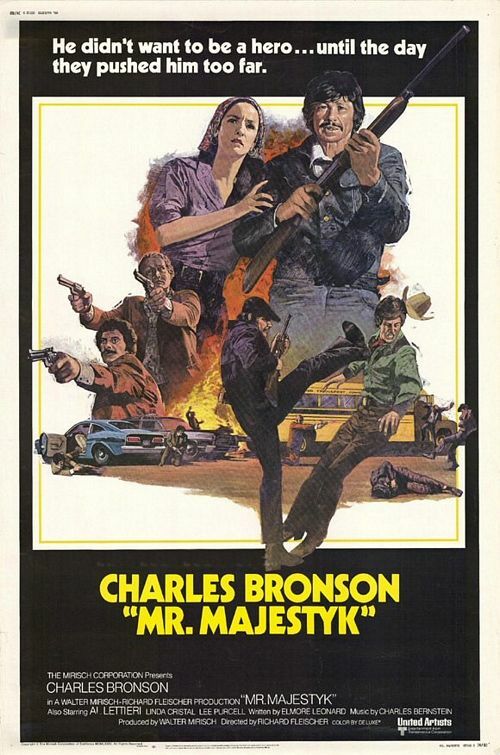 Check out the badass trailer for the 1974 thriller Mr. Majestyk, directed by Richard Fleischer. 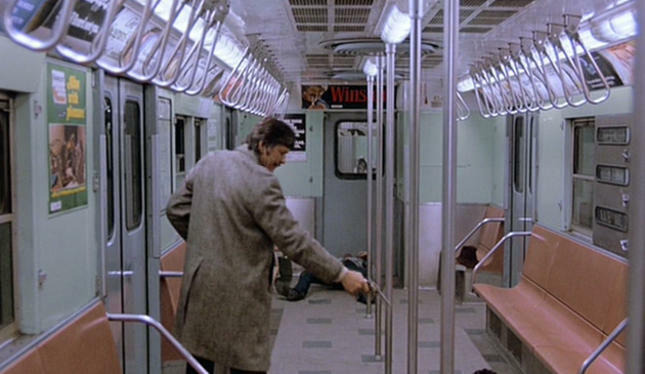 One of the most controversial and shocking films to emerge from the 1970s is without question Michael Winner’s 1974 vigilante thriller Death Wish, a big studio production that seems like it would have been right at home in a seedy 42nd Street theater during the heyday of grindhouse theaters. At the time of its release, most critics waved off Death Wish, which was based off of the novel of the same name by Brian Garfield, as a tasteless and empty-headed exploitation film that advocates vigilantism. While the film certainly never judges Charles Bronson’s Paul Kersey, a liberal man who takes the law into his own hands after his wife is murdered and his daughter is sexually assaulted by a trio of drugged out street thugs, Winner certainly doesn’t make this transition from mild-mannered architect into cold blooded killer look easy or glamorous. About as bleak and unsettling as they come, Death Wish certainly isn’t as dumb as it has been made out to be. Star Bronson has said that he doesn’t believe that the film promotes an ordinary citizen taking the law into his or her own hands, but rather points out that violence just leads to more violence. No matter which way you choose to read Death Wish, I think we can all agree that this a film that really sticks with those who have seen it. 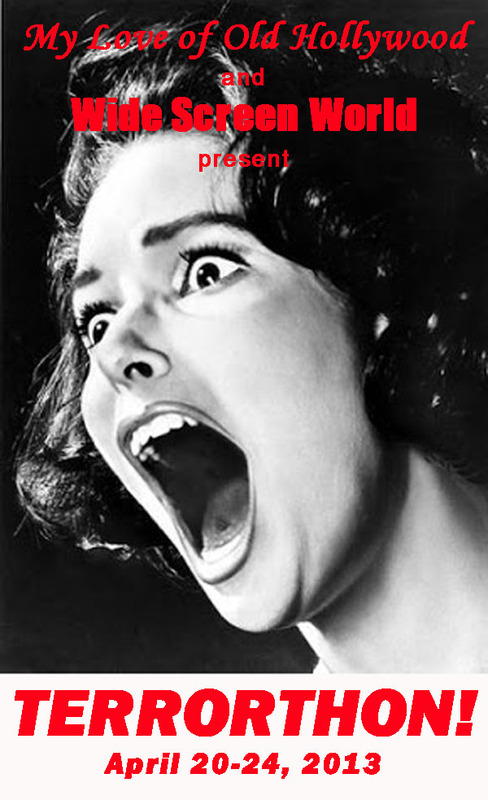 It certainly isn’t a film that is afraid to shake the viewer up. Shortly after returning from a sunny vacation in Hawaii, liberal architect Paul Kersey (Played by Charles Bronson) and his wife, Joanna (Played by Hope Lange), return to their upscale New York City apartment. The New York streets are a far cry from the sunny and peaceful beaches that the Kersey’s were lounging on. Crime runs rampant through the city streets and the police appear to be helpless to stop it. One afternoon, a group of street thugs break into the Kersey’s apartment and viciously assault Joanna and their daughter, Carol (Played by Kathleen Tolan). The attack results in the death of Joanna and Carol is sent into a catatonic state. Devastated, Paul and his son-in-law, Jack (Played by Steven Keats), slowly begin to realize that the police have little hope in catching the men who are responsible for this heinous crime. After receiving a gun as a gift from a satisfied client, Paul begins taking shooting lessons and then takes to the streets to hunt down muggers who hide in the darkened alleys. As the crime rates begin to fall, the police begin to secretly debate whether they should allow the vigilante to continue fighting back against scum or if he should be arrested for the killing spree. Death Wish certainly takes its good old time getting to Paul’s killing spree. His slow descent into bloodthirsty madness is eerily realistic, especially when he dashes home after claiming his first victim and then vomits over what he has done. His revenge doesn’t come easy and I’m glad that Winner points this out. It is painful to watch his hope die as he the police fail to deliver any answers. It makes sense that Winner lingers on Paul’s emotional turmoil, because if the film jumped right into the killing spree, the film would be wildly redundant. When the film erupts in its fits of violence, it will make the hair on your arms stand up. The sequence between the street thugs and Paul’s family will have your stomach churning and you may even cover your eyes once or twice, especially when Carol is sexually assaulted. The scenes where Paul confronts muggers on the New York streets are tense and unpredictable, as Paul throws himself into vulnerable situations, only to reveal a pistol and blow the bad guys away. 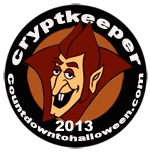 It is truly terrifying the way Paul begins to enjoy his work, faintly smiling when he hears news reports where ordinary citizens praise his work and even offer up their own tales of brutally fighting back against the unruly crime. One story about a little old lady stabbing a thug with a sewing needle was particularly disturbing. 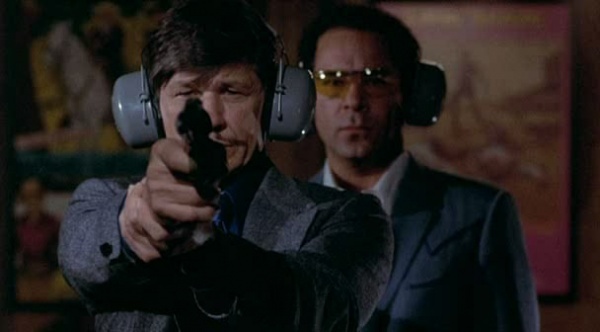 In addition to the controversial subject matter, Death Wish also contains a classic performance from Charles Bronson, the mumbling hardass with a mustache. Bronson’s Paul is a seemingly peaceful and loving family man, a man who was a “conscientious objector” in the Korean War. He appears to have a great relationship with his son-in-law, who is quite fond of calling Paul “dad.” Even when Paul begins to really loose his marbles, he seems like he is coolly in control of his appalling actions. 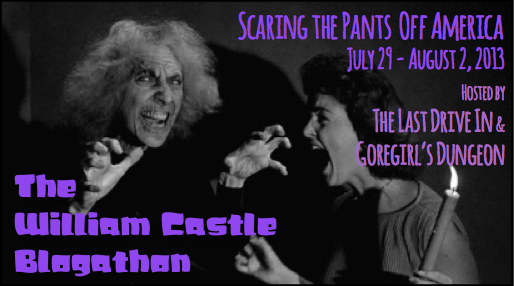 After his first squeamish night, he develops an insatiable love for punishment. Keats gives a jittery performance as the twitchy Jack, who is constantly looking to Paul for some sort of reassurance. He paces and slicks back his hair as he pours over the comatose Carol, desperate for her to be the person she once was. Vincent Gardenia shows up as NYPD Lt. Frank Ochoa, the man tasked with tracking down the vigilante and bringing him to justice. I was genuinely captivated by his confliction over bringing Paul in for his nightly actions. Also keep a look out for a young Jeff Goldblum as one of the thugs who breaks into Paul’s apartment and Denzel Washington as a mugger who makes the mistake of trying to stick up Mr. Bronson. Despite being released in 1974, Death Wish still resonates today, especially when you turn on the news and hear about mass shootings and other unspeakable acts of violence tearing through America. It’s message is certainly troubling, especially since it refuses to ever criticize the trigger happy Paul. Yet when viewed as a portrait of a man consumed by grief, Death Wish is about as haunting as they come. You weirdly root for Paul to make his escapes from the scenes of his crimes and when one thug stabs him, things really get intense. It is incredibly difficult to believe that Paramount Studios, a major Hollywood Studio, was behind a film that is loaded with this much unblinking violence. The real shocker hits about fifteen minutes in with the prolonged torture of Paul’s family, a scene that more than once crosses into exploitation territory. It is tough to find Death Wish entertaining but it certainly is a thought provoking reflection of the violence in all of us that you can’t pull yourself away from. A gritty and unforgiving vision that I would certainly consider one of the most disturbing movies you are ever likely to see. Death Wish is available on DVD.